that’s not a banana you know. she can be Dominican if she wants. to take away the color. next to the pallid guests. Lori D. Nolasco's code-switching, Yo Tambien was written as a response to Langston Hughes’s I, Too, Sing America. Langston Hughes was the "darker brother," so he did not have much choice when he was told to "eat in the kitchen/when company comes." The "too" in his poem's title is a challenge to the white race who dared to exclude him. On the other hand, the children who encounter the persona who "would rather eat in the kitchen/amongst the cinnamon-skinned" do not understand how the blackness was "removed" from her skin. She has the liberty to decide to "become Dominican." As usual, the accompanying photo brings out the spirit of the poem. This is the type of meal I enjoy while in the Dominican Republic: la bandera dominicana with rice, beans and stewed meat. The "banderas" in my Twitter handle refers to flags but the singular form calls to mind the simple meal shared with family. Thank you Lori. We strive to do justice to your poems, the soul of your words, with the accompanying photo. Yo Tambien has me in the kitchen, hungry for more soul food. 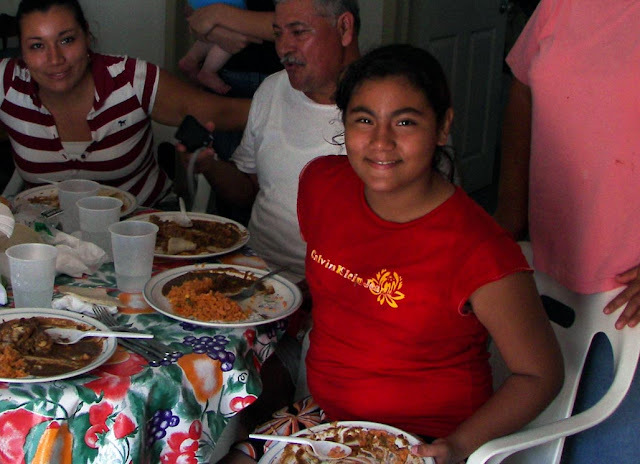 If you and your new bride lived closer, you could come over for pollo guisado, arroz con gandules, mangú (mashed plátanos) and lively conversation in Spanish. How far is Rochester from New York? Pat, I agree. The best parties tend to gravitate toward the kitchen. Rochester is a six-hour drive (seven for me, five for those who speed) from New York City. Pat, there really are people who stand 4'9" and can look me in the eyeballs. It was intended to be funny, since I am not taller than many people. Elderly Dominican women tend to be tiny but feisty, like Tía Rosa. Imagine her waving the paring knife in the air as she tells everyone to "shut up and let her be Dominican if she wants/"